MSI's Vortex is a great demonstration of what can be done. But you can get much more for a lot less, or a little more for way less. If there's one thing I want to do when it comes to building a PC, it's looking at ways to put together a system that doesn't conform to the ATX standards. The ATX layout was introduced by Intel way back in 1995, and it's a dated layout. Intel tried to introduce a replacement for ATX called BTX in 2004, but stopped pushing it after roughly two years. Over time, case manufactures have tried various methods to change design formats, and variations on the ATX form factor have helped. Other form factors like micro-ATX and mini-ITX are based on ATX, keeping the rear IO-port layout and main board format the same, but reducing overall board size. Apple released the cylindrical Mac Pro in 2013, and it was a complete departure. There are some pros and cons to the Mac Pro layout but for the most part, the biggest drawback is its lack of upgradeability. However, there's no denying that decoupling the motherboard's main components into individual modules allows for some truly unique designs. Enter MSI's Vortex, a complete departure from typical desktop designs very much in the same spirit as the Mac Pro. Consider it a gaming PC version of Apple's machine. 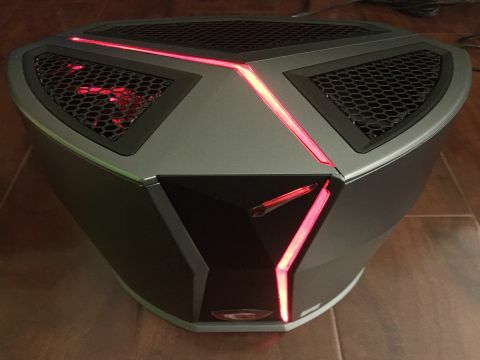 It's structure is cylindrical, and shares many of the same design principles as the Mac Pro, but unlike the Mac Pro, the Vortex brings along gaming cred. There's a lot going on with the Vortex. It's got great connectivity, and MSI has done an excellent job of packing in as much as it can into the smallest amount of space possible. On the inside, everything is custom, and MSI uses a layout very similar to Apple's Mac Pro. Two GeForce GTX 980s flank two of the three sides of the Vortex's guts. A single large fan sits at the top below the grill, pulling cool air through the bottom.. The system works remarkably well in this layout: the Vortex stays virtually silent when you're not gaming, and the system operates cool. Hooray for the laws of convection. Fire up a game and the fan spins up, but it's no louder than your average desktop. Admittedly, I like MSI's intention: take a gaming PC and reformat it into a small form factor but keep traditional large desktop performance. Whether you like the exterior design or not is a matter of personal preference, but when you look inside the Vortex's shell, it's immediately clear that MSI has done an impressive job with the interior. MSI says the Vortex challenges the status quo of desktop gaming systems and that size doesn't matter. It claims the Vortex packs "just as much punch" as a full size system. Unfortunately, in practice, it only gets part of the way there. HDD HGST 1TB 7200 RPM 2.5"
Dimensions 7.61" x 7.01" x 10.55"
Considering the pedigree of the components, the Vortex is a tour-de-force in terms of power to weight ratio. There's a ton of content packed into a volume measuring only 6.5 liters. You simply cannot do this going the DIY route. However, the Vortex has some issues, one of which is quite large. MSI claims the Vortex packs "just as much punch" as a full size system. In practice though, it only gets part of the way there. Here's the thing: the system I configured has dual 980 Tis and not vanilla 980s, and it still costs $1400 less than the Vortex. I have enough money left over to upgrade from dual 128GB NVMe drives to a pair of 512GB 950 Pro SSDs, and then toss in a 2TB 850 Evo SATA drive for good measure. Or I could stick with two 980s and pocket the $1700 difference. Granted, the 980s inside the Vortex have 8GB of RAM instead of the stock 4GB you find on desktop cards, but the 980 Ti remains substantially faster. But hey, two GTX 980s should offer excellent performance, right? Well, not exactly. Nvidia's spec for the GTX 980 desktop version lists a 165W TDP, but Nvidia recommends at least a 500W PSU—and that's for a single card. The Vortex only has a 450W power supply, and it packs two 980s. This tells us that the 980s in the Vortex are mobile versions that run slightly slower than their desktop counterparts. How much slower? We built an equivalent system with two desktop 980s for comparison. There's not a single benchmark where the Vortex comes out ahead. In some cases, the Vortex is nearly 34% slower in gaming. I went digging to find out why this was happening and found some strange answers. I was expecting that the two GTX 980s would be operating in PCIe Gen3 x8 modes, but they weren't. According to both the NVIDIA control panel and GPU-Z, both GPUs were running in only PCIe Gen2 x8 modes. Even more strangely, one of the cards was operating in Gen2 x8 1.1 mode while the other was operating in Gen2 mode. This is strange considering MSI's own GT80S notebook, which has dual 980s, operates both in PCIe Gen3. In case you're wondering, operating in Gen2 x8 1.1 is equivalent in performance to running at Gen3 x2! Working through the strange numbers with Jarred, we thought maybe the Vortex was using a PLX bridge chip to connect the two GPUs, but MSI claims there's no PLX chip in the Vortex. But there's no normal SLI bridge either. Desktop versus Vortex gaps aside, you aren't going to be able to use the Vortex for gaming at 4K except for less demanding games. For most, you'll want to be sticking to a maximum resolution of 2560x1440. MSI tells us that we're able to achieve 100% desktop performance with overclocking of GPU and its memory. But judging from the benchmarks above, no amount of stable overclocking is going to yield 100% desktop-class performance. Besides the odd PCIe configuration, the 450W power supply is also going to be pushing nearly 100 percent loads to deliver true GTX 980 SLI desktop frame rates. For what it's worth, I do like the Vortex a lot. It's compact, well built, and is an impressive manufacturing exercise in form-factor design. When you hold one, you know MSI put a lot of effort into making the Vortex. The exterior is almost all aluminum, and there's an impressive array of ports on the rear for all your needs. In fact, the Vortex can even connect up to six displays—two would connect to the Thunderbolt 3 / USB Type-C ports. I really like the amount of performance per liter. But size is where the Vortex also frustrates me. It just doesn't have enough power to deliver on the promise of desktop-class graphics performance. At most, it's on-par with a heavy gaming notebook that has dual GTX 980 mobile GPUs. You also lose internal expansion, and SO-DIMMs and MXM cards—good luck trying to find an MXM upgrade—are more expensive than desktop components. And then comes the sticker price of $4000. It's just way too expensive for what you're getting. I know: you're thinking the Vortex is for folks who don't want to or don't know how to build their own system. Sure, but that's where gaming system integrators come in, and they can build a system for a lot less. Not only did I build a system for less, it was $1400 less, and it offered way more performance. Maybe there's a BIOS update that will improve frame rates. Maybe there will be a driver to fix the Killer NIC's wireless issues that I experienced, like routinely not being able to connect to a Google OnHub until I rebooted the router. Maybe MSI will lower the price a bit to make things more attractive. But truthfully, no BIOS fix is going to address some of the huge gaps between the Vortex and our high-end desktop system. We also would have been far happier with Intel or Broadcom wireless. If MSI is able to address the performance aspect and get both GPUs to deliver on their performance potential, the Vortex might fill a niche. But for the price premium, the Vortex needs to be just about perfect everywhere else, and that just isn't the case. Impressive as an engineering feat, the Vortex isn't worth its size.